VSPARS uses single cameras to calculate the stripe shapes for each sail. 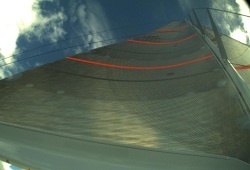 One VSPARS camera on the foredeck with a wide-angle lens is used for all headsails and gennakers. Two VSPARS cameras, one for each tack, are used for the mainsail. The coloured stripes are tracked in real-time and the shape is updated effectively in real time, approximately every 3 seconds. VSPARS outputs include stripe coordinates, camber, draft, entry and exit angles and also the twist angle of the stripe relative to boat centreline. The rig bend and sag and forestay deflection or flying luff position is also calculated, leading to the full 3D stripe coordinates in global space for each stripe. The single VSPARS foredeck camera used for headsails and flying sails has a super wide angle lens allowing sails with extremely long foot lengths to be captured on either tack. 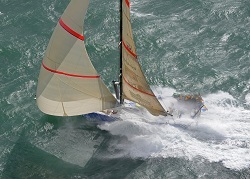 Lens angles are optimised on an individual basis to suit each sail. Each VSPARS mainsail camera uses a standard lens to track mainsail stripes and calculate draft, twist and entry/exit angles, along with rig bend and sag. See how VSPARS captures the rig shape or combines the sails and rig to give the shape and position of everything above deck.